If there’s anything you should know about Halsey, it’s that she’s no stranger to advocacy or activism. When she feels strongly about something, she lets you know about it. Recently she let us know about her battle with endometriosis, she’s freezing her eggs and the reasons why. 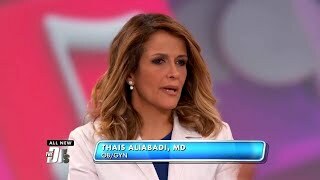 Pop megastar Halsey recently appeared on The Doctors television show, together with her treating physician, Thaïs Aliabadi. Halsey revealed that for many years she suffered from the painful and debilitating condition known as endometriosis, which is caused by rogue uterine tissue growing outside the uterus. The variable and inconsistent symptoms of endometriosis can make it difficult for doctors to diagnose. It’s often either ignored or mislabeled as a consequence of stress, or as merely chronically difficult menstrual periods. It was not until she was seen and treated by Dr. Aliabadi that Halsey’s endometriosis was accurately identified and alleviated by successful surgery. According to the Mayo Clinic, endometriosis can negatively affect a woman’s ability to get pregnant. According to the clinic’s research, approximately one-third to one-half of women with endometriosis have difficulty getting pregnant. So, even though she is only 23 years of age, after consulting with Dr. Aliabadi, Halsey decided to freeze her ovarian eggs to ensure that she will be able to become pregnant when she chooses to bear children. Why do women decide to freeze their eggs? Women freezing their eggs is a component of a complex procedure known as in vitro fertilization (IVF). In the IVF process, a woman’s eggs are harvested and frozen until the time is right to become pregnant. Next, the eggs are thawed and fertilized. The fertilized egg (embryo) is then implanted in the egg donor or in a gestational carrier, a woman who has agreed to allow the embryo to mature in her body. Women freeze their eggs for a variety of reasons. Egg harvesting and freezing, followed later by in-vitro fertilization, is a viable treatment for infertility. It’s the most effective form of assisted reproductive technology that we have today. Surprisingly, new research reveals that most women opting to freeze their eggs don’t do so for career or medical reasons. According to a recent study of 31 women who froze their eggs, the primary reason for doing so was that they simply had not yet found the right parental partner. They want to make sure that their healthy eggs will be available later in their lives. They want to pursue motherhood at the right time and with the right partner. So whether IVF is approached as an infertility treatment or as an elective life plan procedure, egg freezing and IVF have become increasingly popular topics of conversation. Your doctor can help you understand more how IVF works and if it’s right for you.